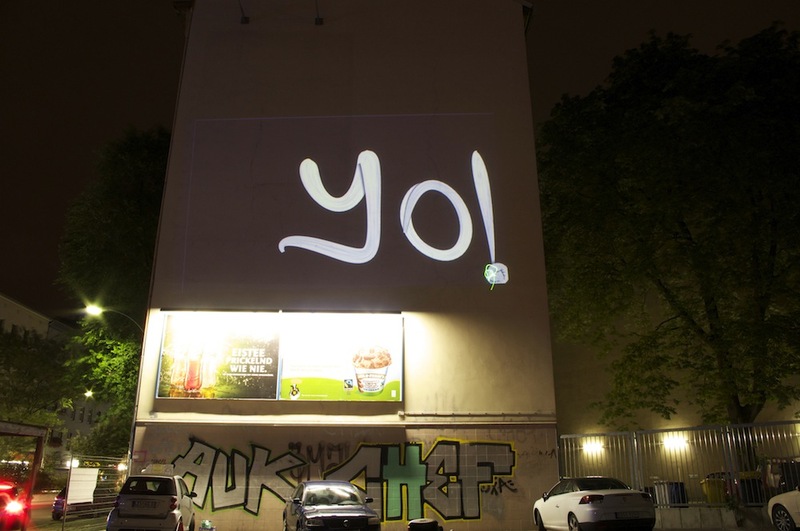 I’ve been part of an international open-source digital graffiti network since 2010. It’s called Graffiti Research Lab (GRL), and since its inception in New York, autonomous cells have sprouted-up all over the globe. My partner, Jesse Scott (GRL Canada), and I were responsible for initiating a cell in Berlin in 2010 and now we’re building up to a major project with our two main German collaborators Hauke Altmann and Semiramis Ceylan (GRL Germany). PWN THE WALL is a networked, three channel video installation, designed to operate with several simultaneous installations in different locations. The video channels are rear projection screens, and one exhibition computer runs all three channels in each installation. One video channel in each installation is an interactive screen, designed to work with an infrared pen – a spray can outfitted with an infrared LED. The artist gestures against the rear projection screen, while an infrared camera situated behind the screen tracks the IR LED from the spray can. The computer software receives the position of the tracked point in realtime, and projects digital ‘paint’ at the matching point. There is an on-screen interface where the artist can change the colour and style of ‘paint, add drips, change from ‘marker’ to ‘spray paint’, etc. At the same time, the software sends the tracked point and paint colour/style to a server, which allows other installations to request those details and redraw them as part of their own installation. Each installation can request the data from any other installation on the second and third channels, and display that in realtime on any appropriate screens. For PWN THE WALL, we will be working between three installations in three cities, each with three channels/screens. So, for the installation in Vancouver, the second and third channels will display the generated output from the installation in Berlin and Seoul. We tested the basic software components, networking with our Berlin allies, during New Forms Festival, September 13-15 2012. We’re happy to say the networking software ran smoothly between the two cities and that the public was able to interact in realtime through the use of a wacom tablet. We’re looking forward to the full set-up October 12-14 during PWN THE WALL. We’ve got a line-up of graf artists from three continents who will meet to draw collaboratively across all three screens. Their interaction will become a visual three-way conversation, collapsing geographical space as their work is created in a zone somewhere between local and global. Besides the open-source aspect (all code and hardware instructions will be released online graffitiresearchlab.ca & graffitiresearchlab.de), we are especially interested in taking graffiti into new spatial relationships through network technology. Displacing geography in this way is a new step for our collectives, and from the response of the graf artists, an exciting prospect for creativity and communication. For event info, updates and potential live-stream information, follow us on Facebook or Twitter.